Menopause brings with it a number of physical, emotional, and mental changes, but it's the emotional and mental symptoms are often the most distressing because they're harder to define than physical ones. One such symptom is memory loss. It can be difficult to differentiate between menopausal memory lapses and the moments of forgetfulness that everyone experiences from time to time. To be able to recognize the symptoms of menopausal memory loss it's helpful first to understand what exactly is meant by "memory." Most of us define memory as the basic ability to recall information and experiences, but it is actually a collective term for the way certain cognitive functions in the brain work together to receive, process, store, and retrieve data, in a way that affects a person's ability to concentrate on and process information as well as recall it. Estrogen levels significantly influence cognitive activity. The hormone works in the blood vessels to increase blood flow to the brain; it also nourishes the hippocampus and neurotransmitters in the brain that control memory. As you approach menopause in your forties or fifties, estrogen levels fluctuate, which in turn affects the brain's cognitive functions. This can cause memory lapses. These lapses are commonly nicknamed “brain fogs”, which refers to both the befuddling experience of menopausal memory loss and the difficulties in defining it. Difficulties in receiving and processing information can make it difficult to concentrate on tasks that require thought and effort, but are not necessarily difficult. If you struggle to concentrate while reading, during a film, or while participating in another brain-engaging activity, such as a game of cards or a crossword puzzle, it could indicate menopausal concentration issues. 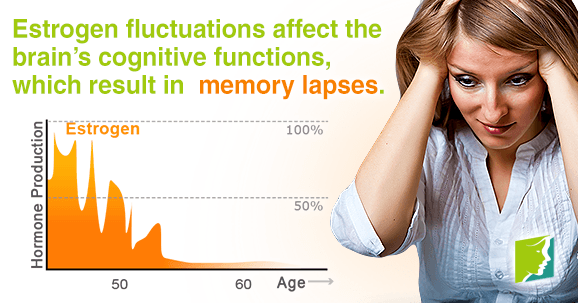 Inability to process new information is the most common symptom of menopausal memory loss. Struggling to recall instructions you were given moments before or finding it unreasonably difficult to adapt to changes in routine, such as having to drive a different route to work or put the trashcans out for collection on a different day, are common examples. Short-term memory lapses (e.g., forgetting the name of somebody you've just met, where you put your keys, or why you walked into a room) are symptomatic of menopausal memory loss, but this is easily mistaken for normal forgetfulness. You may wish to consider asking your partner or friend to pay attention to your moments of forgetfulness over a few weeks to help you recognize when your memory lapses are more than absent-mindedness. Once you know how to identify the symptoms, it's a good idea to keep a record of incidents of memory loss to help you keep track. Rest assured in the knowledge that you are not losing your mind, or experiencing the onset of a serious memory-loss disease, like dementia, which are many women's initial assumptions. Menopausal memory loss is biological, and treating it is the next step. Luckily, there are a number of exercises, activities, and dietary and lifestyle adjustments you can make to improve your memory. Weber, M. & Mapstone, M. (2009). Memory complaints and memory performance in the menopausal transition. Menopause, 16(4), 694-700. doi: 10.1097/gme.0b013e318196a0c9. Weber, M. et al. (2012). Reconciling subjective memory complaints with objective memory performance in the menopausal transition. Menopause, 19(7), 735-741. doi: 10.1097/gme.0b013e318241fd22.